Wizard's First Rule : "Wizard's First Rule: people are stupid." EXCERPT - Pain and dizziness from the fever made Richard only dimly aware that his head has sunk to the table. He groaned while his mind spun with the implications of what Kahlan had told Zedd; of the prophecy of the secret Book of Counted Shadows come to life. Then Zedd was at his side, lifting him, telling Kahlan to help get him into the house. As he walked with their help, the ground slipped this way and that, making it difficult to Catch it with his feet. FL Speak - This is the book i was waiting for a long long time to do a review on. 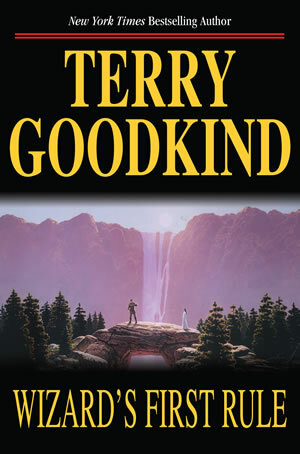 Terry Goodkind, with his first novel has created a legend. The entire 'Sword of Series' saga revolves around a woods guide named Richard Cypher and his destiny. Richard Cypher is simple woods guide who lives in Westland. The Westland is protected from a few other places like Midlands and D'Hara by a magical boundary. In Westland, there is no magic and people with the gift of magic cannot cross the boundary. In comes the beautiful Kahlan Amnell through the boundary and begins the first sign of trouble. This is the story of a boy who struggled to accept the idea of magic and yet he must master it if he and humanity is to survive the darkness brought upon by Darken Rahl, the ruler of D'hara. This is a story of Zeddicus who is the First Wizard and of Kahlan Amnell, the Mother Confessor and their decision to appoint Richard as Seeker and forever be his guardian. This is an epic tale of courage, belief and love. Its the tale of the sword of truth that feeds on the anger of Seeker. Its the tale of lies and betrayals and torture. Its the tale of people fighting for their right to be free. This is a world where heart hounds stalk the magical boundaries between countries, and where artists can draw more than just your likeness. It is the world where a simple man becomes the seeker of truth and lays waste to any enemy that moves. This is the world where he must learn the first step of being a wizard. Where he must learn the Wizard's First Rule. My Rating - 4 out of 5. I will proudly say this is one of my favourite epic sagas. Though with the first book, Terry Goodkind left a lot to be expected, the sequels i believe will do justice to what looks like a legendary journey. you my dear FL got me hooked to this series .. Although i am slow in reading series , five books later i still love it ! !